An early article by Bridgman , who later won the Nobel prize in physics, triggered research into phenomena occurring in solids at large plastic strains and high pressures. His elegant method involving torsion of small disc-shaped samples between two ‘Bridgman anvils’ has become a popular technique of severe plastic deformation (SPD) . In developing the high-pressure torsion (HPT) technique, Bridgman was inspired by a stunning multitude of phenomena in nature that occur when shear deformation is coupled with high pressure. These include the formation of various geological structures, earthquakes, and the metamorphism that gives rise to a rich gamut of minerals and ores. While being driven by scientific curiosity, Bridgman also set very tangible practical goals: “The new ‘high pressure’ method might eventually result in means of making useful alloys from metals which cannot be combined into alloys by the conventional method of fusion at high temperature”. With reference to these prophetic words, our message here is that in a very near future HPT and similar SPD techniques will become potent manufacturing tools. We expect the area where this is going to happen is micro/meso scale manufacturing where SPD will be used to produce superior materials for parts whose characteristic dimensions range from 10 mm down to 10 microns. SPD technologies have been around for about 20 years. A defining feature they have in common is the use of giant shear deformation in conjunction with a gigantic, gigapascal-range, hydrostatic pressure. Despite the extremely large cumulative strains that a workpiece undergoes in these processes, its dimensions remain practically unchanged, as distinct from traditional metal forming operations. The consequences of SPD treatment for processed materials in terms of their mechanical properties are remarkable, as their initial grain structure is reduced in a spectacular way – down to deep submicron scale, and in some cases to nanoscale [3-5]. The last ten years have seen efforts to transfer the substantial knowledge accumulated through laboratory-scale SPD research to industry application. The main drawbacks of SPD for ‘real’ manufacturing of larger parts have been low productivity and high cost caused by the high pressures and very large strains involved. As the smallest attainable average grain size increases with growing dimensions of the workpieces, the benefits of SPD processing in terms of strengthening by grain refinement are thus lost on parts with large dimensions. The situation improves radically if SPD processing is applied to small-scale engineering. Here the problems of upscaling disappear. In the ‘real’ manufacturing of miniaturised items, the workpiece sizes and the achievable batch volumes are easily manageable with the currently available laboratory equipment. This is exemplified by a superstrong aluminum alloy AA7075, fabricated by HPT in form of a disc 20 mm in diameter and 0.8 mm in thickness . Thanks to its unique combination of low elastic modulus and high strength, this material allows the manufacture of miniature parts with extremely high responsiveness to mechanical load. Tens or even hundreds of such parts for use in micro-electromechanical systems (MEMS) can be produced from a single HPT-processed disc. The gravity of the drawbacks of larger-scale SPD application becomes less critical with downscaling, while its indisputable advantages come to the fore. Indeed, in addition to the need for high strength, an essential requirement is a low scatter in the properties of a batch of articles, such as MEMS, made from a polycrystalline material . This can only be achieved if its average grain size is much smaller than the dimensions of the articles. Hence, the lower limit on the size of manufactured parts is set by the degree to which the grain structure can be refined. With the average grain size of SPD-processed materials being in the order of 0.1-1 microns [3-5,8], manufacturing of parts with typical cross-sectional dimensions as small as 10 microns becomes viable. In our vision of small–scale engineering, articles made from new ultrafine-grained materials would be produced by microcutting and microforming. Another major advantage of the SPD processes is its ability to create entirely new materials with special inner architecture, unachievable by other manufacturing methods. SPD offers the possibility of material transport within the workpiece and mechanically driven solid-state chemical reactions induced by large plastic deformations under high pressure – precisely the features Bridgman has highlighted in his seminal work. The ways in which novel hybrid materials with rich inner architecture can be synthesized by using SPD techniques were outlined in a recent overview . Figure 1 illustrates some phenomena which promote SPD-induced synthesis and compares them with those found in nature. Striking similarities between patterning in natural rock masses and metal multilayers deformed by HPT were highlighted in a most recent publication . The possibility of creating pre-conceived microstructural patterns offered by SPD enables the realisation of the idea [11,12] that a superior combination of properties can be achieved by producing heterogeneities and gradient structures. Figure 1. Pattern formation in nature and SPD-induced materials synthesis. The pictures demonstrate analogies between geological formations in the Earth’s crust (upper row, adopted from ) and microstructures produced by HPT (middle row). The lower row displays examples of articles which can be produced by SPD-assisted microfabrication. A higher resolution figure may be found below the article. 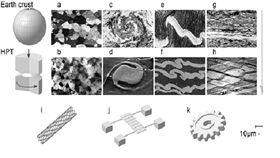 (i), (j), and (k): examples of miniature articles which can potentially be manufactured from SPD-processed materials: a bioresorbable vascular stent from magnesium alloy WE43, a sensitive elastic element for MEMS from aluminium alloy 7075 , and a cogwheel from a superstrong high-entropy alloy , respectively. The small size of SPD equipment for manufacturing of minute parts means that it can be used on a laboratory benchtop or even an office desktop – making it as accessible as desktop manufacturing by 3D printing . A small-scale production facility of this kind can also serve as an R&D laboratory. Such combined manufacturing/research units will be very efficient in answering the industry’s demands for small-scale engineering. Paraphrasing the famous maxim of Richard Feynman, there is a lot of space (three orders of magnitude!) in the dimensional range of SPD processing from the current laboratory scale (10 mm) down to 10 microns – certainly more than in the manufacturing of upscaled parts from the current laboratory samples. We hope that this communication will attract the attention of researchers, engineers, and entrepreneurs to this manufacturing avenue. Re-directing the efforts at upscaling SPD technologies to downscaling will enable industrial applications of SPD processing in microfabrication, which is arguably one of the most promising manufacturing areas. We believe that severe plastic deformation technologies are to become a major vehicle for fabrication at a millimeter and submillimeter scale. Bridgman, P.W. Effects of high shearing stress combined with high hydrostatic pressure. Phys. Rev. 48, 825–847 (1935). Valiev, R.Z. Nanostructuring of metals by severe plastic deformation for advanced properties. Nature Mater. 3, 511-516 (2004). Estrin, Y. and Vinogradov, A. Extreme grain refinement by severe plastic deformation: A wealth of challenging science. Acta Mater. 61, 782–817 (2013). Valiev, R.Z. Materials science: nanomaterial advantage. Nature 419 887–888 (2002). Huang, Y., Langdon, T.G. Advances in ultrafine-grained materials, Materials Today 16, 85-93 (2013). Liddicoat, P.V. et al. Nanostructural hierarchy increases the strength of aluminium alloys, Nature Comm. 1, Article number: 63 (2010). Kahn, H., Heuer, A.H. and Jacobs, S.J. Materials issues in MEMS. Materials Today 2, 3-7 (1999). Suryanarayana, C., Mechanical behavior of emerging materials. Materials Today 15, 486-498 (2012). Beygelzimer, Y. et al. Synthesis of hybrid materials by severe plastic deformation: A new paradigm of SPD processing. Adv. Eng. Mater. 17, 1853–1861 (2015). Pouryazdan, M. et al., Mixing instabilities during shearing of metals. Nature Communications 8, 1611 (2017). Ma, E. and Ding, J. Towards strength-ductility synergy through the design of heterogeneous nanostructures in metals. Materials Today 20, 323-331 (2017). Wu, X.L. et al. Synergetic strengthening by gradient structure. Mater. Res. Lett. 2, 185-191 (2014). Passchier, C.W. and Trouw, R.A.J. Microtectonics (Springer, Berlin, 2005). Schuh, B. et al. Mechanical properties, microstructure and thermal stability of a nanocrystalline CoCrFeMnNi high-entropy alloy after severe plastic deformation. Acta Mater. 96, 258-268 (2015). Figure 1, high resolution format. See above for details. Publishers' note: Article updated 15th January 2018 to replace incorrectly rendered symbols. Download the full text article now. It's hard to keep track of the burgeoning AM industry. Liz Nickels spoke to Louis Davis of Stone Interactive Group to help users make sense of it all.